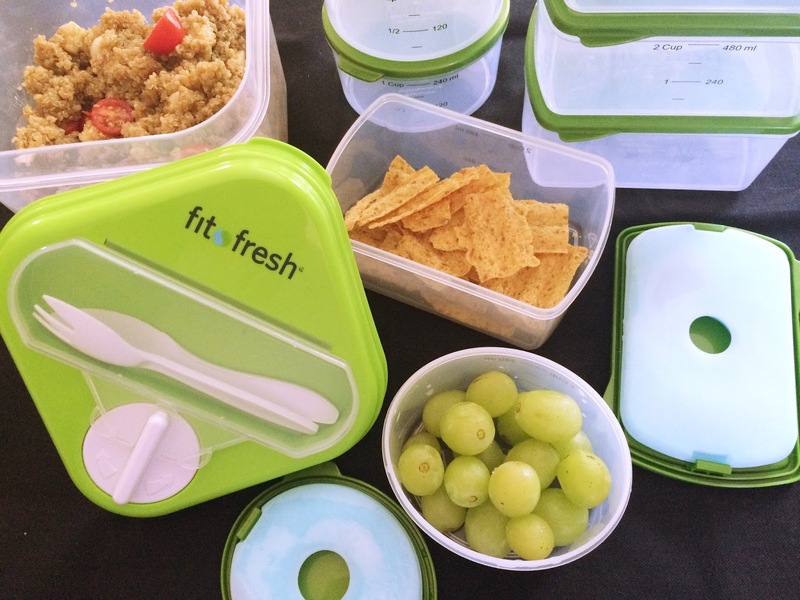 For the last two weeks, I've been putting the Fit & Fresh Lunch Kit to the test. I was given the opportunity to sample this product, and I had fun doing it. I've recently gotten into making and taking lunch to work. In the past I would go out for lunch and buy fast food like Arby's, Subway, Burgerville, Taco Bell, or teriyaki. Not only was this weighing on my wallet, but I was also feeling awful with that greasy food rotting in my stomach for the rest of my 10-hour shift. I like to take a variety of things like sandwiches, wraps, fresh fruit, salads, crackers, vegetables, or whatever leftovers are available. It is important, I've learned, to mix up the lunches so I don't get bored and want to revert to my old ways. In steps Fit & Fresh. I was glad when they reached out to us about trying their products because it added another motivation and new enjoyment to packing my lunch. You won't see me carrying a sad brown paper sack with zipper-sealed bags. No, I'm toting a polka dot insulated bag filled with cute green containers. The kit includes 4 1-cup containers, 4 2-cup containers, 2 ice packs for each size of container, and one Salad Shaker Container with a built-in ice pack. I've found that having these containers helps me cut down on the amount of disposable bags and containers I'm using. Reusable food storage is cheaper and more environmentally friendly. When I first opened the box to look at my Fit & Fresh kit, I was surprised by how many containers it came with. I was skeptical about their durability at first too because they looked flimsy in comparison to other brands I've used. At this point, though, they haven't sustained any damaged. I put them through the test by washing them in the dishwasher, microwaving them, and tossing them around as I carry them to and fro between work and home. They've held up well so far. My favorite item is the Salad Shaker. It is a large 4-cup container with a utilitarian lid. The lid features a holder with a small knife and spork, a big ice pack, and a cool little spot to store dressing. The twist and release dressing dispenser drops a fresh serving of dressing right onto your salad. In a way, this container only makes sense for salad because of this feature, but it can, technically, be used for storing other foods. Green salads make the best use of it, though. The biggest negative for me was the knife and spork. They seem too small to use comfortably, and I felt like it was going to snap in half while I was stabbing my greens with it. It is easy enough to bring a regular fork, but the idea of built-in portable cutlery is awesome. It just wasn't a homerun in this case. Overall, I love the Fit & Fresh lunch kit because I can take a variety of items to work and not have to use disposable containers. The measuring lines on the side of the container make it easy to get the correct portion to keep your lunch healthy, and they look cute. These are useful tools for making lunch fun even as an adult heading to work each day. You can learn more and purchase your Fit & Fresh containers here.